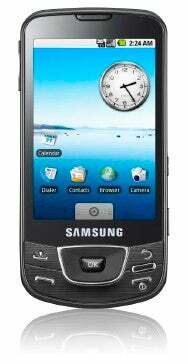 Samsung Electronics became the first major mobile phone maker to launch a smartphone based on Google's Android software. The South Korean company on Monday unveiled the I7500, which sports a 3.2-inch touchscreen, a 5-megapixel camera and 8GB of internal memory. It's 11.9 millimeters thick. The I7500 will be available in major European countries starting from June, the company said. The mobile phone joins two Android handsets already on the market from High Tech Computer (HTC) of Taiwan, the T-Mobile G1 and the HTC Magic. Android handsets from other makers have also been announced. The smartphone can connect to mobile phone broadband services through HSPA (High Speed Packet Access) as well as Wi-Fi, Samsung said. Developed by Google, Android is a smartphone operating system that is meant to make Web browsing, especially on Google sites such as YouTube and Google Maps, easy. Samsung did not reveal pricing for the handsets nor when the handset will be out in other parts of the world.